Difference between revisions of "Canadian Mennonite, The (1953-1971) (Periodical)"
Bound sets are held at Mennonite archives and historical libraries. An index to the paper is available; see Additional Information below. Although <em>The Canadian Mennonite</em> was unable to sustain itself, it clearly filled a need while it was in existence. On the date of its last issue, an ad hoc group met at the MCC (Ontario) offices in [[Kitchener-Waterloo (Ontario, Canada)|Kitchener]] to discuss how to fill “the communication gap left on February 19 when <em>The Canadian Mennonite</em> was last published.” In August, 1971, the first issue of <em>The Mennonite Reporter</em>, with editorial team of Frank H. Epp and Dave Kroeker, appeared to fill that gap. Although <em>The Canadian Mennonite</em> was unable to sustain itself, it clearly filled a need while it was in existence. On the date of its last issue, an ad hoc group met at the MCC (Ontario) offices in [[Kitchener-Waterloo (Ontario, Canada)|Kitchener]] to discuss how to fill “the communication gap left on February 19 when <em>The Canadian Mennonite</em> was last published.” In August, 1971, the first issue of <em>The [[Mennonite Reporter (Periodical)|Mennonite Reporter]]</em>, with editorial team of Frank H. Epp and Dave Kroeker, appeared to fill that gap. Epp, Frank H. <em>The Glory and the Shame</em>. Winnipeg: Canadian Mennonite Publishing Association, 1968. An Advisory Board of Consulting Editors was appointed in June 1959. On 1 October 1962 the paper was transferred to The Canadian Mennonite Publishing Company with over 200 shareholders representing at least eight Mennonite groups. The first elected 12-member Board of Directors included four of the earlier Consulting Editors. It announced that “the basic format and direction of the paper remains the same.” At the direction of the shareholders, the Company was converted to a new non-profit Canadian Mennonite Association in June 1963. The publishing office moved from Altona to Winnipeg in February 1965. A further name change to Canadian Mennonite Publishing Association took place in April 1967. Frank H. Epp, Abbotsford, BC was appointed as the paper’s first editor following his graduation from Canadian Mennonite Bible College. Over the years several assistant or associate editors shared the responsibility: Larry Kehler (July 1955-July 1956); Aaron Klassen (June 1959-June 1961); David Kroeker (May 1963-August 1969); George C. Friesen (August 1969-1971). 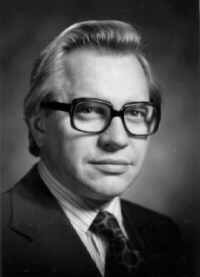 Kehler rejoined the editorial staff in June 1966 and succeeded Frank Epp as Editor and General Manager in August 1967. Part-time staff included William Klassen (Bible Study Editor, January 1966-October 1967); Albert Zehr (Ontario Editor, September 1968-August 1969); Vernon Leis (Ontario, August 1969-1971); Hugo Jantz (BC Editor, May 1969-1971). The format throughout its history was 28 x 38 cm with five columns of text and photographs. Normal size was 8 pages, but 10 or 12-page issues were not uncommon. The non-profit paper was funded by advertising revenue and subscription income. Rates rose gradually from $2 per year to $5. The masthead sub-title of the paper was “A weekly paper of news and opinion,” although Biblical quotations were also used in the earlier years. In addition to reporting news about Mennonites in Canada and beyond, regular features of the paper included book reviews and notes, reports on schools, institutes and colleges, and articles of “opinion, interpretation and comment.” The Glory and the Shame, a collection of editorials by Frank H. Epp published in booklet form in 1968, is a reflection of the paper’s stance. Swath and Sheaf, a booklet of selections from a columnist using the pen name “Isbrandt Hildebrand,” shows another forum in which potentially controversial issues were treated. The subscriber base of the paper remained too small to sustain it financially, even with the added revenue from advertising. After a peak of about 6,000 in 1966, it again declined to just over 4,000 when the directors decided to end the publication. Most subscribers were from western Canada. Although The Canadian Mennonite was unable to sustain itself, it clearly filled a need while it was in existence. 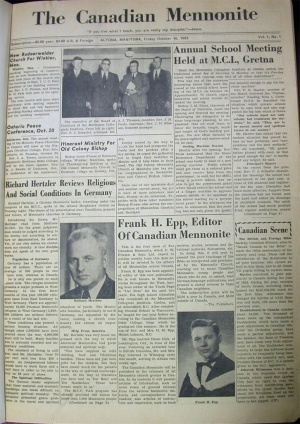 On the date of its last issue, an ad hoc group met at the MCC (Ontario) offices in Kitchener to discuss how to fill “the communication gap left on February 19 when The Canadian Mennonite was last published.” In August, 1971, the first issue of The Mennonite Reporter, with editorial team of Frank H. Epp and Dave Kroeker, appeared to fill that gap. Epp, Frank H. The Glory and the Shame. Winnipeg: Canadian Mennonite Publishing Association, 1968. Friesen, T. E. “The Story of The Canadian Mennonite.” Canadian Mennonite (14 August 1959): 2. “High Aims and High Hopes.” Canadian Mennonite (16 October 1953). Hildebrand, Isbrandt. Swath and Sheaf. Winnipeg: Canadian Mennonite Publishing Association, 1970. “Introducing The Canadian Mennonite.” Canadian Mennonite (3 July 1953). Kehler, Larry. “CM will cease publication.” Canadian Mennonite (13 November 1970). “New Venture of Faith.” Canadian Mennonite (5 October 1962): 1, 6. The Archives of the Canadian Mennonite are located at theMennonite Archives of Ontario. A pdf index of the Canadian Mennonite is available at https://uwaterloo.ca/mennonite-archives-ontario/sites/ca.mennonite-archives-ontario/files/uploads/files/canadian_mennonite_index.pdf. Ens, Adolf. "Canadian Mennonite, The (1953-1971) (Periodical)." Global Anabaptist Mennonite Encyclopedia Online. February 2005. Web. 24 Apr 2019. http://gameo.org/index.php?title=Canadian_Mennonite,_The_(1953-1971)_(Periodical)&oldid=123001. Ens, Adolf. (February 2005). Canadian Mennonite, The (1953-1971) (Periodical). Global Anabaptist Mennonite Encyclopedia Online. Retrieved 24 April 2019, from http://gameo.org/index.php?title=Canadian_Mennonite,_The_(1953-1971)_(Periodical)&oldid=123001.